Director – Harvey Hart, Screenplay – Robert Schlitt, Based on the Novel by John Buell, Producer – Julian Roffman, Photography – Rene Verzier, Music – Harry Freedman, Songs – Karen Black, Production Design – Earl Preston. Production Company – Host Productions. Montreal police detective Jim Henderson and his partner investigate after a girl falls to her death from an apartment tower. Their investigation reveals that she is Elizabeth Lucy who was working as a call girl and had a heroin addiction problem. In the days that led up to her death, Elizabeth was pressed by her madam to take on a powerful new client. Elizabeth became afraid after she found the client’s men were investigating and following her. Henderson becomes obsessed with the case as it leads him on the trail of a devil worship cult. The Pyx is a film I have seen referred to in various genre cinema reference books but finding a copy has always eluded one. This would seem to be a problem that many others have faced and the film never appears to have surfaced during the video or dvd era. Thanks to the miracles of the internet whose dark corners can eventually be found to house almost anything, this issue has now been remedied. Occult films were legion during the 1970s after the massive successes of Rosemary’s Baby (1968), The Exorcist (1973) and The Omen (1976). The Pyx came out six months after The Exorcist did, although its take on matters occult is not influenced by that film and its determination to shock audiences but rather with Rosemary’s Baby and its vision of secret societies conspiring against the heroine and engaged in rituals that have been modelled on Catholicism. (The Pyx is very much a film rooted in Catholicism – it sees that the sacrificial person needs to have been a Catholic, while the coven leader’s end explanation sees surrendering to devil worship as the abandonment of all that Catholicism stands for. The title of the film incidentally refers to a small container used in Catholic liturgy to carry The Communion Host, one of which features peripherally to the events in the film). The Pyx is not always an easy film. It has an interesting double structure – one that starts with detective Christopher Plummer’s investigation into the murder, before giving equal time in interspersed flashbacks to tell what happened to Karen Black in the days leading up to her death. The problem with this is that the film is not particularly tight as a detective story – there are almost no scenes where Christopher Plummer pieces clues together and makes any sudden aha revelations. This double structure gives us a film that seems to almost entirely take place in incidental detail – while we are wanting to find out what happened, the story spends its time ambling around Karen Black’s life, clients, friends, dealings with her madam, before introducing the threat of the mystery client late in the game. It is not always clear where these scenes are leading. This makes it particularly frustrating in terms of looking at The Pyx as a genre film. It is, for example, 85 minutes into the film’s 108 minute running time before we get any mention of the occult rituals. I knew that The Pyx had genre elements before sitting down to watch it, however if you were watching the film not knowing any of this, you would never guess that that is where the plot is going. One of the more interesting aspects of The Pyx is that it makes a virtue of being shot in Montreal. From the 1990s onwards, various Canadian cities became used as cut-price locations by Hollywood because they look so much like American cities (an entire Canadian film industry grew up around this). Even Canadian-made films suffered an identity crisis and began to pass themselves off as being set in American cities on the theorising that this would sell them to wider markets. The Pyx is a film made before this practice set in and it is nice to see a Canadian film shot for wider release being unapologetic about its own identity. Even more so, in that Montreal is located in the French-speaking province of Quebec, it is a film where the language spoken by the characters does not all come in English. 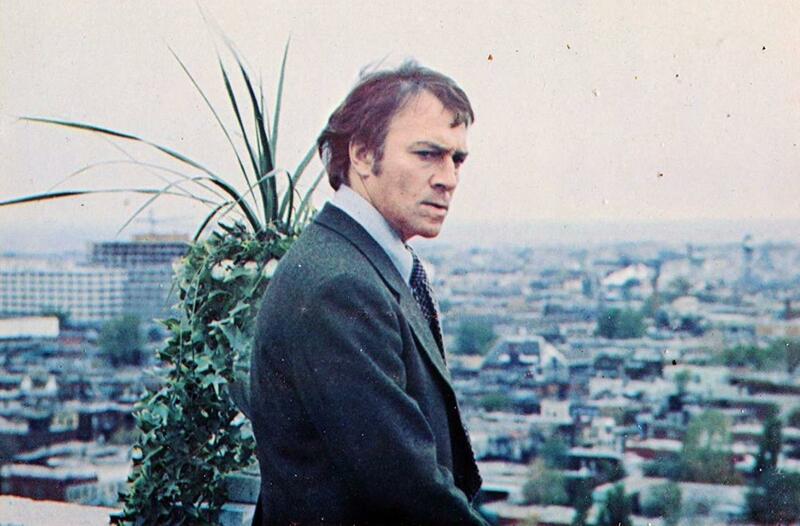 The opening crime scene comes in a bewildering range of both English and French dialogue (unsubtitled as well) and Christopher Plummer even speaks French to the people he questions during the course of his investigation. Karen Black is listed as the lead. Black’s career was launched after a small part in Easy Rider (1969) and her profile rose through films like Five Easy Pieces (1970), Airport 1975 (1975), Day of the Locust (1975) and Nashville (1975). In recent years, she has gained somewhat of a reputation as a Scream Queen due to roles of this era such as Trilogy of Terror (1975) and Burnt Offerings (1976) and since the late 1980s up until her death in 2013 made a career out of appearances in B genre films. Black was an unlikely leading lady – today her cross-eyed looks would never get past a casting agent, while her frequent space cadet method of acting would surely never get her the attention today that it did back in the 1970s. Here she even sings a number of songs of the soundtrack (which are not that bad either). Second billed, although getting the lion’s share of the screen time, is Christopher Plummer. One has gotten so used to Plummer as a mature actor with some surprisingly prolific appearances in his senior years that you tend to forget that he has a career going all the way back to live television in the 1950s before his breakout role as Captain von Trapp in The Sound of Music (1965). The Christopher Plummer we have here is from the heyday when he was still a young leading man. Director Harvey Hart never appears to have done much else of significance. He directed much in the way of tv, both in Canada and the US, including even an episode of the original Star Trek (1966-9). In genre material, he also made Dark Intruder (1965), an unsold pilot for a tv series featuring Leslie Nielsen as an occult investigator that was released theatrically, and the tv movie The Aliens Are Coming (1980). The film also features as producer Julian Roffman, best known as the director of the Canadian 3D horror film The Mask (1961).